Since you are reading this, I guess you have your heart set on becoming a successful blogger? But maybe you think your budget is holding you back. Don't worry you can make a blog work on very little cash. Guess what you will have to be courageous and do a lot of difficult work, but you already know that right. Besides hard work, it also helps to have some good direction. You have likely already read a lot of articles on how to create a successful blog in the past. I am confident after reading this post you will be able to create a successful blog on a budget with confidence. 1. Want to know how to narrow several niches down and pick the best one. 2. Want to know which hosting companies offer the best hosting packages. 3. Need to know how to write great content for your blog. 4. Still trying to become a more successful blogger. 5. Have a blog but want to make it stand out. 6. Need to stop holding back and be yourself. After you know how to do the six objectives above you will be well on your way to becoming a successful blogger. The following 8 tips sometimes may go against the grain but have a proven record of success. Not only for me but for many others as well. Some might even call them mistakes. Yes, mistakes which I would advise you to commit if you have not done so already. If you try to avoid committing them, your blog will not stand out. You will be part of an ordinary bloggers’ crowd that is a dime a dozen. So throw away you're if this and but that out the window. Instead, commit to these mistakes to become a courageous successful blogger. Jump right into blogging with enthusiasm. So you are just planning and researching. You want to surprise the blogosphere as soon as you enter into this field. You want others to share with others what a wonderful blog you have after visiting your first blog post. If so you may have a great deal of disappointment waiting for you. Please do not expect this to happen so easily. Believe me, you really do not want it to be that easy anyway. If it was other bloggers could easily enter your field and grab your audience from you. This is not something we should expect or want to happen. Sometimes we want to wait to make the perfect move at the perfect time. Yes, this is often the smart move, but it does not always work out. Like swimming sometimes you just have to jump in. Do you learn to swim on land or in the air? Nope, you first have to dive into the water. Either with a trainer or with some sort of support, you learn to swim in the water. So do you think you will become a great content writer by just storing your posts into your hard drive? Maybe showing them to your loved ones will do the trick? Although feedback from friends and family can be useful. It's far from being what you need. More times than not they will tell you they love your work. If for no other reason than they would be afraid to hurt your feelings otherwise. Show your creations to strangers and get the most truthful feedback. 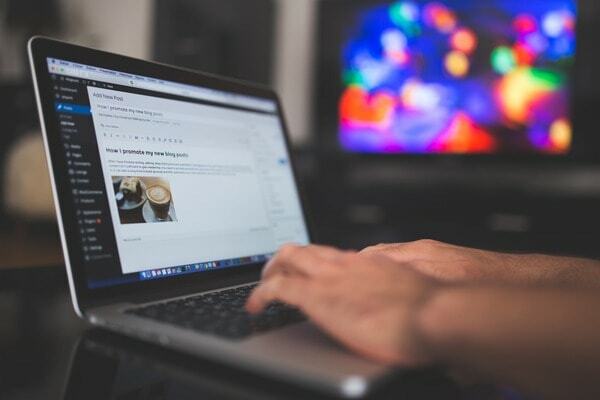 Start a blog right way as soon as you can and start getting feedback. Get yourself in the water and will figure this stuff out. Like with swimming finding someone to train you will speed up the process. You can find a mentor to teach you for free sometimes. You would be surprised how willing others are to teach if only asked to. But do not let that stop you from getting started. You can learn a great deal by just driving in by yourself. Don't worry unlike with swimming your life is not at stake if you fail. So please jump right in with enthusiasm. What you hear from pro bloggers all the time. Do not go for the freebies. I do believe in investing to earn money. But for startups, it is ok to go for the freebies. Get everything for free if you can. 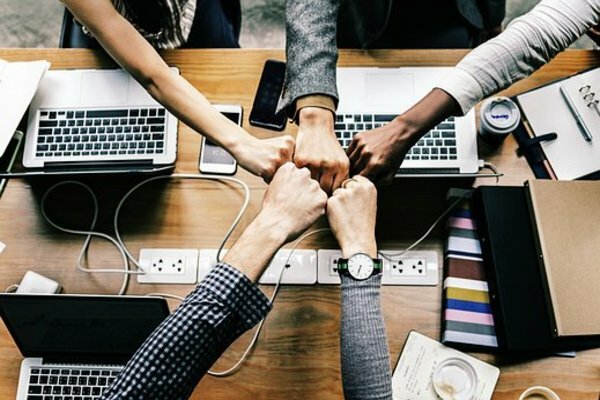 Blogging is one of the unique businesses in the world which you can start without spending a dime. It is also an awesome business which you can start without knowing it and learn it bye and bye. You should not be afraid to start on these grounds. If it fails, you will lose nothing. You have started it with everything for free. So go for everything for free or cheap if you can. The courage this will give you will help you be a more successful blogger. Put aside the advice from bloggers that tell you to buy paid products right way. Paid products will not help you until you develop your blogging skills. After your skills are developed you will know what is worth your investment. So learning the robes with freebies is the way to go if you ask me. In time you will want to put more and more money into your blog. But it is ok to wait until you actually know what you are doing. Are you afraid of looking foolish? Don't let this make you avoid taking part in discussions on social media. So what if people think you are foolish. That will not make it true. If you avoid failing then it is more likely you will never learn. So never be afraid of others views and keep learning. It's fine to copy others style but not their content. But do copy their style. Don’t worry, no one will call you a copycat. Did any of us call a toddler copycat? What does a toddler do? It copies us and walks with its feet. So in every field, first people follow their elders, then adapt their own style. Look at superstars of the film industry. Every superstar of today earlier copied another superstar of yesterday. After that, he developed his style. So same happens in blogging. If you love someone’s blogging style, just copy it. After a while, you will have more wonderful ideas to develop your style. Do remember, great ideas don't usually come at once. You need to apply your mind and keep on thinking to discover the best path for your blog. It's fine to start a blog even without previous blogging knowledge. Your style will develop in time. Your lack of knowledge can be an asset to you. It will keep your mind constantly on how to make your blog more successful. You will think and think to conceive great ideas. You will develop your voice, and people will hear it. This is also another mistake people might be stopping you to commit it. But this is not stealing others ideas. If you remember not to copy their content. After analyzing your competitors you will know what has already been written. This you can’t do with surveying. You cannot create a big log book to note down blogging ideas conceived so far. The best way to find out what knowledge is lacking in your niche is to be aware of whats already out there. In this way, you will have a vast knowledge of needed ideas and subject matter. Then you will know what content needs to be written in your niche. And guess what you will be the one to produce them on your blog. No one is perfect in this world. Nor is there any person that makes perfect decisions. If you ask thousands of people for advice, you will get thousands of options. Everyone will tell you their own unique perspective. Frankly, there is no way to know who is right without giving it a shot your self. Better to make a guess, instead of trying to wasting time trying to figure out who knows the answer. Apart, from any technical issue, simply make a guess if you do not know what to write about. With practice, you will learn what is best and what is unacceptable to your audience. Don’t hide your ideas, fearing someone will steal them. So what if someone steals them. In the beginning, if someone steals your ideas, what does it mean? It means you know what you are doing. This is the best way to assess the value of your ideas. So as soon as an idea is stolen, don't start hiding them. Instead, pat yourself on the back for knowing what you're doing. Don’t’ stand still. At some point, you will likely hit a wall where it looks like things may not be working out. After that, you have two options. Either to get back to point zero or keep pushing until you reach your destination. What do you want to do? Start over and return to point zero? You got it that is not the answer. You will lose twice if you want to go back. First, you lose everything you have spent to get there. Also, you will have to spend more to get back to your original position. Your blog may appear to be dead or not getting many visitors. Still, keep moving even if it is a wrong track. Because moving is necessary. This is why we must have enthusiasm for our niche. Enthusiasm is very important! It will take you to the midst of your blog journey and beyond. Pushing to reach your destination is the right approach. If you pause your blogging you will likely stop altogether in that niche. There is no guarantee you will be successful in another field either. So keep posting to your blog till you are dead-sure you can’t make it in that field. Have patience and post with consistency. Stay enthusiastic and jump right in and get going! 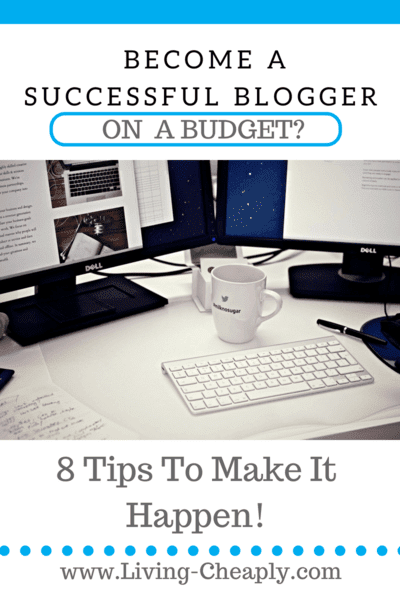 These are the eight tips that will help you become a successful blogger on a budget. Never, forget that our past failures are our best teachers. That means getting out there and sharing your content. Don't be afraid of freebies! Remember its fine to copy as long as its not their content. Keep your enthusiasm. If you do not have enthusiasm for your niche you have already failed. Lastly drive in and keep swimming until you have reached success. Living Cheaply would love to hear about your experience blogging in the comments below. Have you found success yet?! Thanks for reading and living your fun-filled cheap life! Copyright © 2019 Living Cheaply, All Rights Reserved.